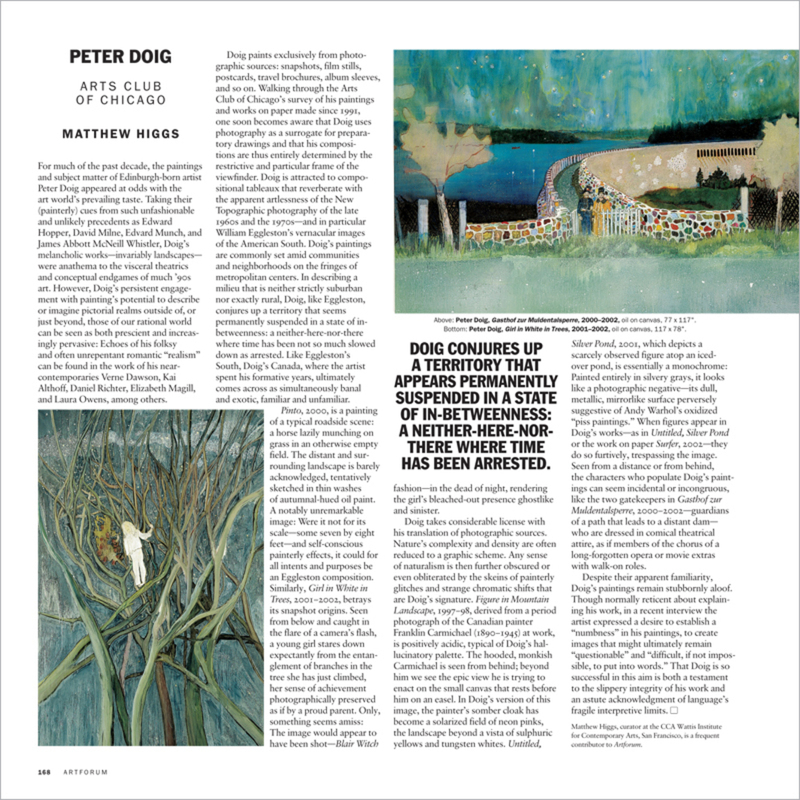 For much of the past decade, the paintings and subject matter of Edinburgh-born artist Peter Doig appeared at odds with the art world’s prevailing taste. Taking their (painterly) cues from such unfashionable and unlikely precedents as Edward Hopper, David Milne, Edvard Munch, and James Abbott McNeill Whistler, Doig’s melancholic works—invariably landscapes—were anathema to the visceral theatrics and conceptual endgames of much ’90s art. However, Doig’s persistent engagement with painting’s potential to describe or imagine pictorial realms outside of, or just beyond, those of our rational world can be seen as both prescient and increasingly pervasive: Echoes of his folksy and often unrepentant romantic “realism” can be found in the work of his near-contemporaries Verne Dawson, Kai Althoff, Daniel Richter, Elizabeth Magill, and Laura Owens, among others.